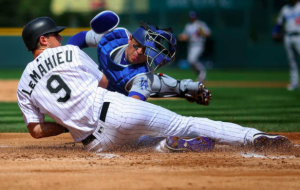 As it turns out, 162 games weren’t enough to separate the Los Angeles Dodgers and Colorado Rockies. The two teams finished the 2018 regular season with identical 91-71 records. That will force a one-game playoff for the division title Monday afternoon in Los Angeles. The winner will be N.L. West champions and go on to host the Atlanta Braves in Game 1 of the NLDS on Thursday. However, the season won’t be over for the loser, who will travel to either Chicago or Milwaukee for Tuesday’s Wild Card game. Momentum can play a huge role in games like this, but it’s tough to see what side has more heading into this game. The Rockies finished the season with nine wins in their final 10 games. Of course, that stretch began immediately after they got swept by the Dodgers in a three-game series. In fact, Colorado lost five of six games against the Dodgers in September. The Dodgers, meanwhile, won 13 of their final 17 games, including that three-game sweep of the Rockies. After a sluggish start to the season, the Dodgers put together a strong second half in what turned out to be a competitive division. It wasn’t quite enough to claim the N.L. West title outright. However, a win on Monday will give the Dodgers their sixth consecutive division title. Rookie Walker Buehler will get the nod Monday against the Rockies. In 22 starts this season, Buehler is 7-4 with a 2.43 ERA, and he’s been even better lately. Buehler has allowed two or fewer runs in 10 of his last 11 starts. The caveat is that the one bad start during that stretch came against the Rockies. However, he bounced back in his next start against the Rockies, allowing just two unearned runs in six innings while striking out 12 when he faced them on September 19. The Rockies will send 23-year old German Marquez to the mound to face Dodgers Monday. Outside of Kyle Freeland, Marquez was undoubtedly Colorado’s best starter this season. In 32 starts, he went 14-10 with a 3.76 ERA. In his 13 starts since the all-star break, Marquez is 6-2 with a 2.55 ERA, so like Buehler, he’s finished the season strong. Perhaps more importantly, he allowed two runs on four hits in 15 innings at Dodgers Stadium this season, although both of those starts came during the first half of the season. Both starting pitchers are set up to have good outings, but ultimately, both are likely to leave this game in the hands of their respective bullpens. This could sway the game in favor of the Dodgers. Despite some injury problems, the Los Angeles bullpen has come on strong in September. Closer Kenley Jensen has rebounded from his health scare to have an outstanding September. Kenta Maeda can also be a huge asset in a one-game playoff. As a starter now pitching in relief, he can go multiple innings, giving the Dodgers a great bridge from Buehler to Jensen. The Rockies, on the other hand, have one of the highest bullpen ERAs in the National League. However, only part of that can be attributed to playing at Coors Field. Key relievers like Jake McGee, Brian Shaw, and even closer Wade Davis who the Rockies were counting on this year have all had somewhat disappointing seasons. Unless Marquez can throw the first complete game of his career, the Rockies will have to rely on their bullpen at some point, something that should make them a little nervous. Both teams should feel good about the starting pitcher on the mound Monday. Both teams should also feel good about how they finished the season. However, the Dodgers have the home-field advantage, as well as a slight edge offensively and in the bullpen. Much like the last five years, I see the Dodgers taking home the N.L. West crown. Los Angeles wins 5-3.